We're Mississauga's animal removal and pest control experts. We operate throughout the region and can have a wildlife removal and pest control technician to your address quickly! With a population base greater than 750,000 and home to Canada's largest airport and transportation hub, you might think this is no place for nuisance animals or pests to reside. Think again! Mississauga has pockets of very mature natural environments, as well as continued fast paced development that has been ongoing for years. 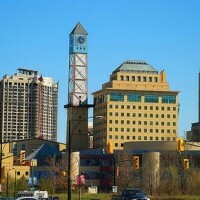 Mississauga is urban, with green getaways built in. This means there is plenty of opportunity for wildlife to thrive, and move around. With new development comes animal, pest and rodent population displacement. Throughout the city nuisance pests are looking for a place to call home, particularly during winter and baby seasons. Whether it is an attic or squirrel that has gained entry into your attic, or mice that have penetrated the walls of your home or wasps nesting in the corner of your deck - we have a pest control solution that will rid you of the problem! What makes Mississauga beautiful - golf courses, natural greenspace, parks and mature neighbourhood trees - also provide wildlife and pests the opportunity to move around and find the perfect home to nest. Don't let that be your house or property! We deal with nuisance animals, rodents and insects commonly found within the city and use safe, humane practices to rid them of your property - whether your home or business. We humanely remove squirrels, skunks, raccoons, birds or whatever nuisance animal has breached your home, shed, deck or other area. Particularly in summer, we're pros at ridding homes from wasp nests and treating homes for insect pest issues like ants and spiders. Whatever your pest issue, call the wildlife experts and certified exterminators at Halton Wildlife. Contact Us Now for your FREE animal removal or pest control quote!